with healthy vending options at work. Are your employees tired of junk-food only vending machines at work? Now days, most employees are looking for healthy, natural or low-calorie snack options to help propel them through their busy days and late nights. 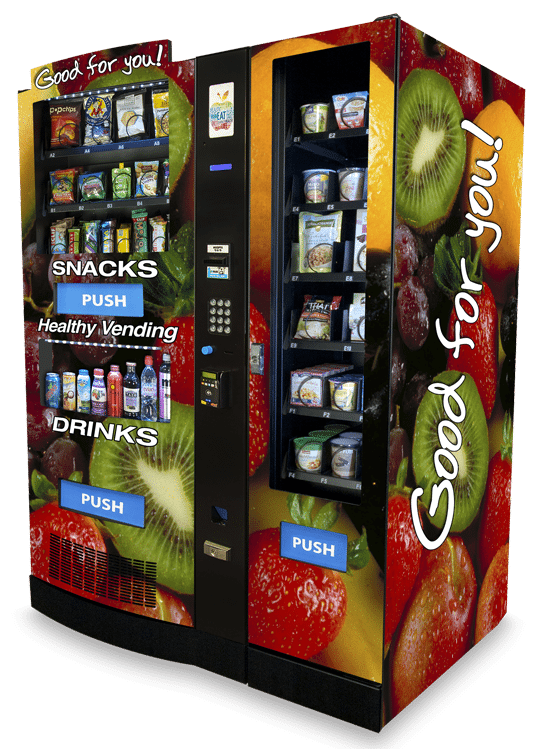 HealthyYOU Vending is the right choice for both companies and their employees. Don't Wait. There Are a Limited Number of HealthyYOU Vending Machines Designated for Your Area. Who is the agent that referred you? Who is the coordinator that referred you? Filling out this form does not obligate you nor your company in any way. Your personal information is kept strictly confidential and will not be shared with external parties without your consent. If you would like to provide healthy products that everyone in your workplace will appreciate, please fill out the form to receive more information (click here). Studies indicate that healthy employees are more productive and take less time off from work for health-related reasons. HealthyYOU Vending helps promote wellness by providing companies and their employees with healthy snacks and drinks in the workplace. Our machines are locally owned and operated so you will be able to personally meet and get to know your area vendor. These superbly trained operators have a vested interest in your employees’ satisfaction and have access to over 1,100 healthy vending products! Best of all, there is NO COST and NO COMMITMENT required by your company! Keep reading to find out more about our high-tech and user-friendly Healthy machines. What is the #1 Reason You Want to Provide Healthy Vending for Your Employees? Should this information be forwarded to someone else in your company?